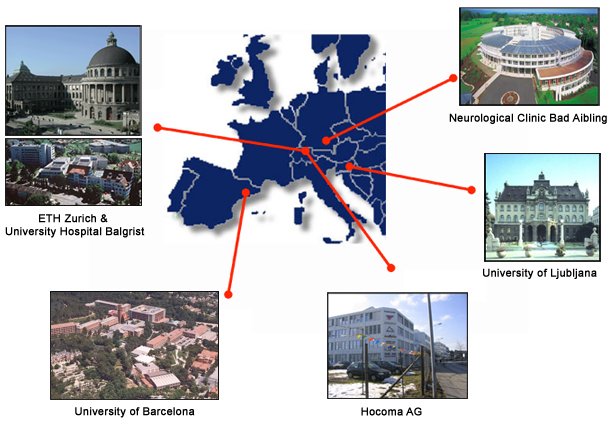 Research and development activities of the MIMICS project are funded through the European Union under the 7th Framework programme. The main hypothesis of this project is that movement training for neurorehabilitation can be substantially improved through immersive and multimodal sensory feedback. The approach is real-time acquisition of behavioural and physiological data from patients and the use of this to adaptively and dynamically change the displays of an immersive virtual reality system, with the goal of maximising patient motivation. This will result in complex systems that are natural, user-friendly and easy to use. In this project two exemplary systems will be developed for robot-assisted rehabilitation of upper and lower extremities. The systems will be able to record multi-sensory data (motion, forces, voice, muscle activity, heart rate, skin conductance etc.) and process this data in real-time to infer the intention of the patient and the overall psycho-physiological state. The computed information will be used to drive the therapy robots in combination with immersive virtual reality systems including 3D graphics and 3D sound. Several individually adjustable scenarios will be set up and the patient will be immersed into the corresponding virtual environments. Experimental tests on humans will evaluate to which such systems can increase the motivation of the patients and, thus, the therapeutic outcome of the training. New basic insights will be obtained about presence and motivation in humans. Furthermore, MIMICS technology will enter clinical routine so that large patient populations (e.g. stroke, spinal cord injury) can benefit. Motor rehabilitation will become more efficient and may reduce costs of the European health care systems. A multi-national network is required to better compensate regional differences and increase international acceptance. The MIMICS consortium is characterised by an ideal balance of engineers, computer scientists, physicians and one industrial partner, who are all word-leaders in their respective fields.